or any pair of phone wires ! You may already know about StarBus. It lets you attach RS-232 devices directly to a single twisted pair of wires. Each PC, terminal, printer, modem or controller can be involved in its own data link - or even broadcast to a group of devices; not just one-to-many, but each to any or many! ...All multiplexed onto a single pair of cheap phone-grade wire. It's like a phone system for data, but there's no central switch or server! Each device can be set to any speed or even handshake-off without slowing throughput of the shared wire! But what about campuses or buildings that have no extra wire pair to dedicate to RS-232 sharing? 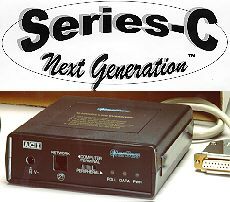 Now there's a way to send serial or even parallel data over an existing Ethernet! Mate each port to our new StarBus for Ethernet and attach anywhere along the network. Each box has two serial ports and a parallel port (each independently addressable). 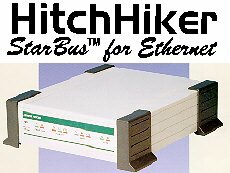 StarBus for Ethernet turns serial or parallel data into TCP/IP packets. It even works over the Internet! Connect to your ethernet using any popular scheme: 10Base-T (UTP/RJ-45), 10Base-2 (ThinNet/BNC), or 10Base-5 (AUI/DB-25). StarBus for Ethernet works just like our plain-wire StarBus: Any number of full-duplex data connections, each transparently multiplexed onto one high speed bus. You can broadcast, get a network map, even initialize parameters remotely. Each piece of RS-232 equipment can be set to its own speed and handshake, because StarBus does the conversion for you! Choose Web Page or Acrobat for higher resolution print-out. Some controls dealers have asked for reviews by other dealers who are bold enough to go "where no one has gone before" (apologies to Kirk & Picard). This on-site evaluation of StarBus provides specific tips for using it with either building controllers. It's from a very early customer (just after the beta was shipped). It is available in either Here. The MS Word version contains three pages of network diagrams! We're looking for anyone to pony up a more current independent evaluation. Tell it like it is...Don't pull any punches. We'll give you a free upgrade to the latest version (up to three) at no charge, just for letting us post your review on this web site! A current price list . . . Subscribe to our StarBus newsletter. 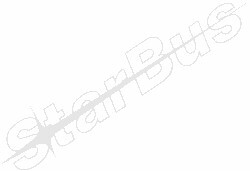 Click the end of this line for the StarBus / IMCO Home Page.